Most of the actions in The Welkin Suite IDE have hotkeys already assigned to them, and almost all other actions could have hotkeys assigned to them to improve the performance of development. You can change hotkeys assignments for any action in the Options Menu: Tools ⇒ Options… ⇒ Environment ⇒ Keyboard no matter if they are predefined by default or not. 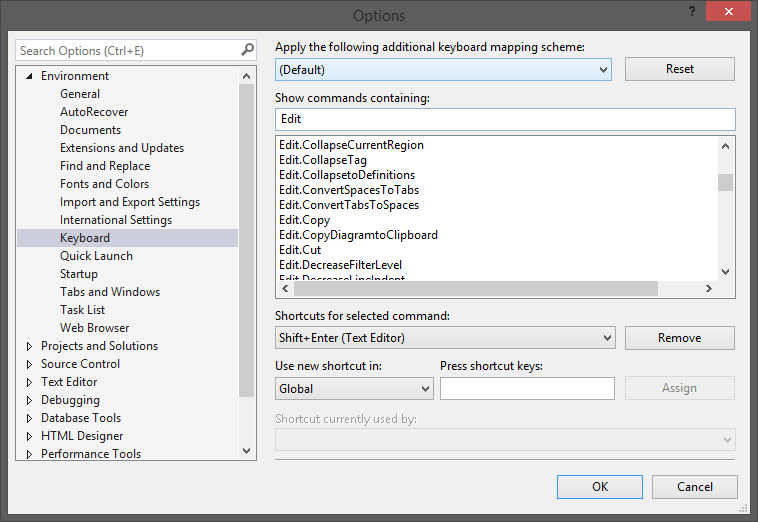 To change or assign a hotkey to a command / action you may look for a required command manually in the list of all the commands, or you can start typing its name in the box above the list, for example, Edit would filter commands in the list to only those containing Edit in their name. after this, click the Assign and OK buttons.